Entry No. 331, Petrocosmea 'Shortnin' Bread', exhibited by Julie Thompson. Score: 93. First Place. Entry No. 231, Petrocosmea 'Shortnin' Bread', exhibited by Tim Tuttle. Score: 92. Second Place. Entry No. 311, Petrocosmea 'Shortnin' Bread', exhibited by Paul Kroll. Score: 89. Third Place. Entry No. 156, Petrocosmea 'Fluffer Nutter', exhibited by Beverly Williams. Score: 88. Honorable Mention. Entry No. 163, Petrocosmea 'Fluffer Nutter', exhibited by Doris Brownlie. Score: 88. Honorable Mention. Entry No. 256, Petrocosmea 'Shortnin' Bread', exhibited by Nancy Kast. Score: 85. Entry No. 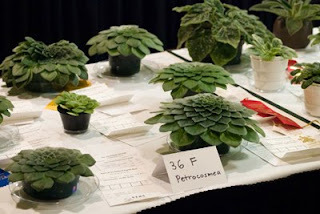 310, Petrocosmea 'Fluffer Nutter', exhibited by Paul Kroll. Score: 83. Entry No. 401, Petrocosmea 'Momo', exhibited by Nancy Carr. Score: not scored.